Recently got the two new Transformers Masterpiece figures in MP-29 Shockwave (or Laserwave as he's known in Japan) and MP-11NR Ramjet. Both have divided the opinion of collectors, but for me I love both of them! 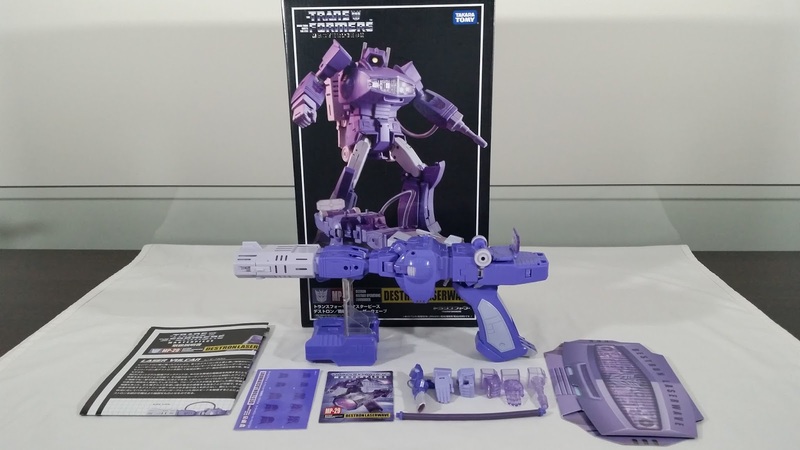 Both come in the usual classy Takara MP box art, with Shockwave coming with the collector coin too. 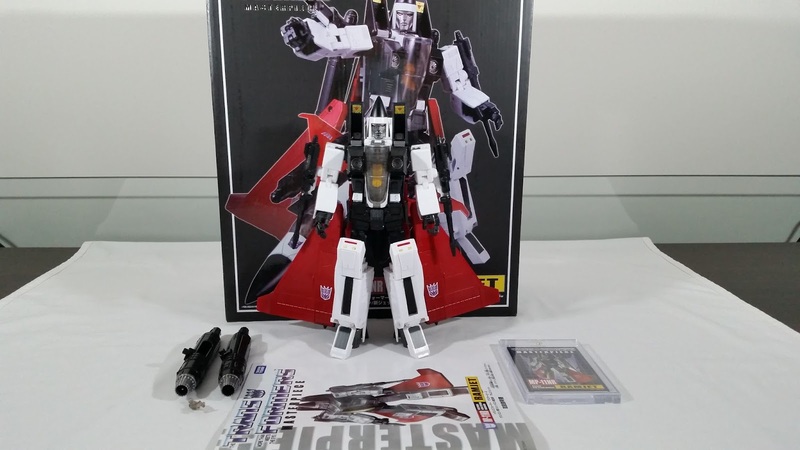 This time unfortunately a coin was not included with Ramjet for some reason. The other exclusives in Skywarp and Thundercracker both had coins, so I was a little disappointed that Ramjet missed out. 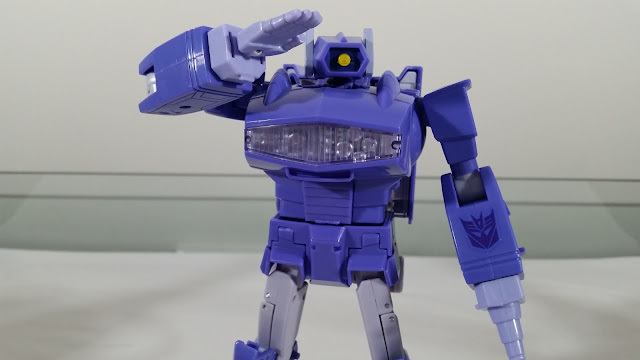 Many collectors have complained about the colour and size of Shockwave, and perhaps the well-received 3rd party Fans Toys Quakewave skewed the expectations on the official MP. But when you compare the figure against the colour and scale from the original G1 cartoon, you'll find that it's actually very accurate! 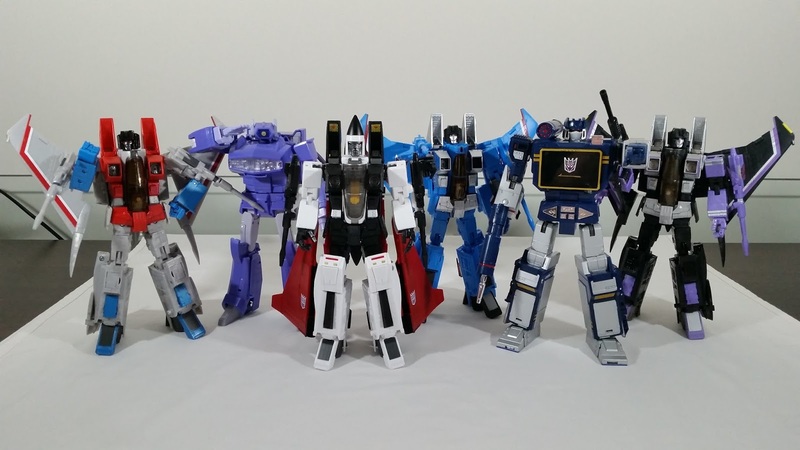 Shockwave was not taller than Starscream or Soundwave from the screenshots that I've seen, and the figure scales pretty closely to that (as you can see in some of the group shots below). The transformation sequence is pretty simply, with my "Masterpiece Moment" definitely being the all-in-one transformation of the front of the gun to the backpack. The use of the long diecast steel centre pole that connects all that together is a nice bit of engineering. It's a little bit of partsforming to use the base in gun mode to finish off the backpack in purple, but that's not really needed. Either way, I think the figure looks fantastic, with a colour that is nice. Perhaps a tad shade darker would've been good, but the way it is it just fits in nicely with the others anyway. 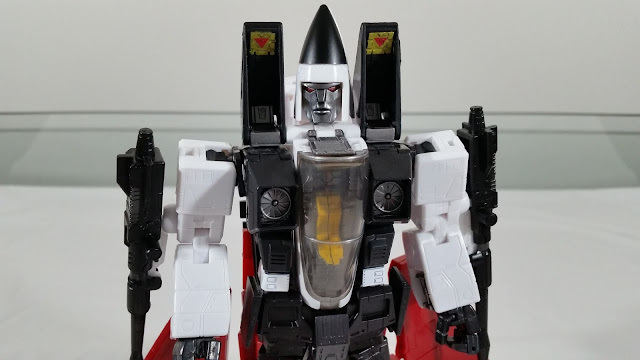 Ramjet is a heavy retool of the current MP-11 mold, but the changes make all the difference! There is a bit of parts forming to allow the conversion of the null rays in bot mode to being the fatter cluster bombs in jet mode. But for me that's a great compromise to achieve that cheat from the cartoon in a real world toy. The cheat in the conehead too is also nicely done, and I love the face sculpt and paint app. The dark grey gun metal looks fantastic. The overall proportions of the body also seem pretty accurate to the cartoon. Some collectors have complained that he looks too chunky with large knee pads, but that's exactly how he looked in the cartoon! So again, I'm definitely glad Takara went that route with the figure. The alt mode transformation is pretty straight forward, although the small red sections of the wing near the front was quite scary the first time. Bending those down definitely feel fragile, so be very careful there. But once done, the mold difference from the standard MP-11 jet mode looks fantastic. The ability for the wings and arms to tab into each other properly did raise a manufacturing issue with the figure though. I was lucky that mine had correctly assembled shoulders. 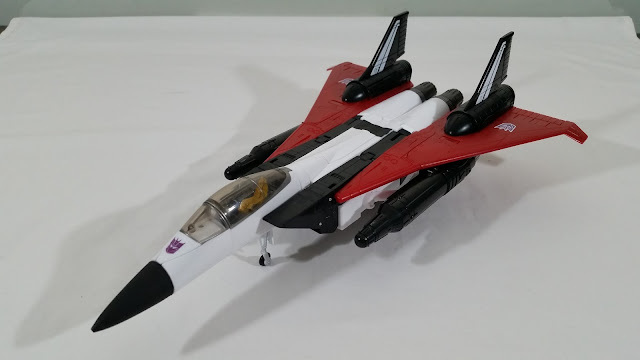 But there are many reports of incorrectly assembled shoulders that prevent the wings and arms tabbing into each other correctly in jet mode. 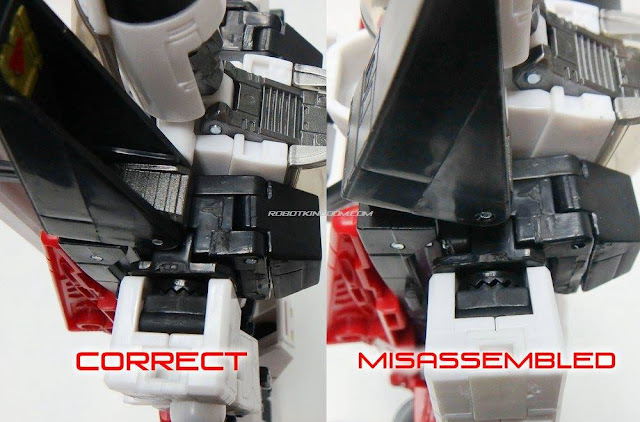 Robotkingdom posted the photo below showing the difference between correct and incorrect shoulders. You'll see that on the correct version, the shoulder plate that connects the arm to the torso has a longer section facing the front of the figure, and the shorter section at the rear. But on the incorrectly assembled version, the plate has been reversed so that the short section is facing the front. This causes the misalignment with the wings during transformation. If you have a bad one, I'd definitely be contacting your retailer for a replacement. 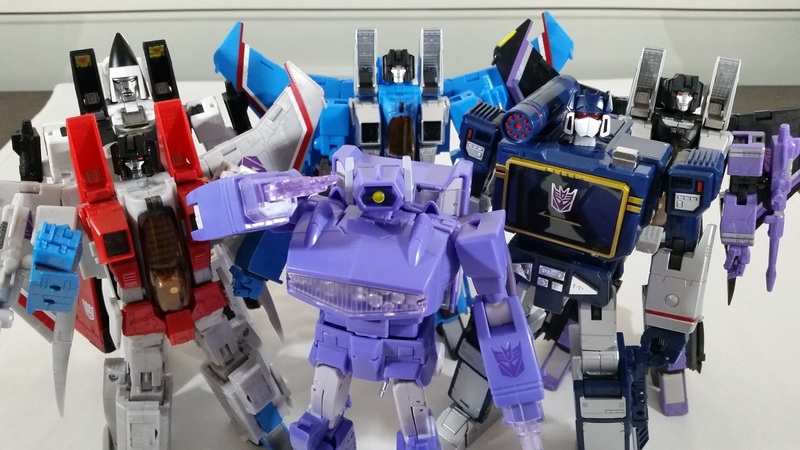 Overall, these two new MPs are a fantastic addition to the MP Decepticon ranks. They've always been outnumbered by the Autobots, but this levels the playing field at least a little.